NOTE: If your iPhone contacts are backed up on your iCloud account, you can access the account on a computer connected to the Internet and export the contacts in a vCard file for use on the Android phone. NOTE: Although the methods above require a computer with Internet access, alternatively you can share your iPhone contacts using third-party apps. My Contacts Backup is an iOS third-party app that can back up and share iPhone contacts via email. NOTE: Another third-party app you can use is Send Anywhere on Android and iOS. The app uses a peer-to-peer connection to share content cross-platform. Follow steps below to Transfer iPhone Contacts to a Motorola Moto Z3. 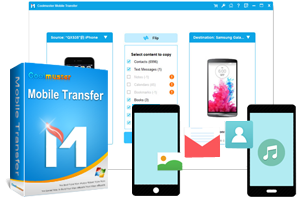 First you need a pro Phone Transfer program. Connect iPhone and Motorola Moto Z3 to computer via usb cables, start the program. A short time scanning later, you can directly transfer contacts between them.